While GAZeL remains committed to eLearning. eLearning is just the beginning! Innovative Learning is so much more! Innovative Learning includes new ideas and technologies such as blended learning, digital curriculum, innovative learning spaces, to mobile learning, individualized self paced learning, competency and outcome based education, flipped classrooms, adaptive learning models, Innovation Labs and Makerspaces, 3d printing, coding, project based learning, robotics, game based learning, virtual lab experiences and more. Get involved in GAZeL! GAZeL is leading development of the Arizona Innovative Learning Collaborative. ​Sign-up as a GAZeL Associate. Participate in the Arizona Innovative Learning Collaborative! Attend our events. Volunteer. Sponsor GAZeL, our events, and the Collaborative. 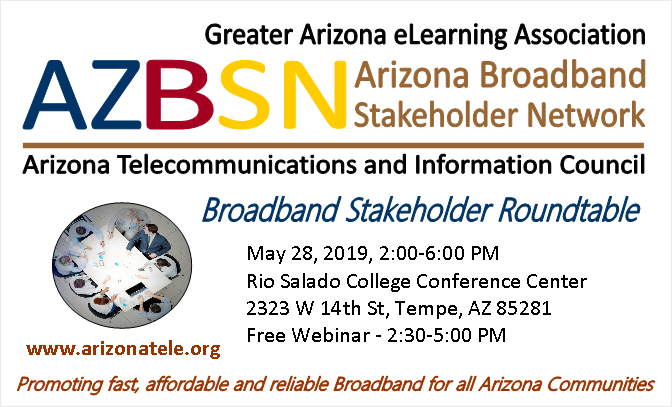 GAZEL, and ATIC, the Arizona Telecommunications and Information Council, are leading the development and coordination of the Arizona Broadband Stakeholder Network. On May 28, 2019 we will present the first of a series of Stakeholder Roundables in Tempe Arizona. ​The Network and Roundtables will provide Arizona public, private and nonprofit stakeholders opportunities to collaborate on initiatives and strategies to accelerate deployment of fast, affordable and reliable Broadband Internet access in communities throughout Arizona, and to enable those communities to utilize those connections to: support 21st Century education, create jobs and support economic development; train a 21st century workforce; enhance public safety and health care and; connect their citizens to the world.